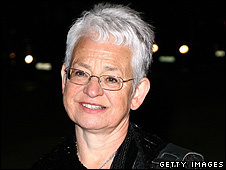 A children's book by Dame Jacqueline Wilson is to be altered after parents complained it was inappropriate. Publisher Random House says it received three complaints about a vulgar term used in My Sister Jodie, which is aimed at children aged 10 and over. In future editions, the offending word will be altered by one letter and replaced with "twit". Dame Jacqueline, creator of Tracy Beaker and a former Children's Laureate, has sold more than 30m books. She is known for tackling gritty social subjects such as teenage pregancy, domestic violence and failed suicides. Random House says more than 150,000 copies of My Sister Jodie have been sold in the UK since it was published in March. The novel tells the tale of two sisters with very different personalities whose relationship is tested when their parents take up jobs at an old boarding school. A spokesman for the publisher said the vulgar term had been included "on purpose" because it was uttered by "a nasty character". "However, Jacqueline doesn't want to offend her readers or her readers' parents, so when the book comes to be reprinted the word will be replaced with twit," he added. The decision to alter the text came after supermarket chain Asda announced it would stop selling the book. Their move followed a complaint from one shopper in Stanley, County Durham. Anne Dixon, 55, bought the novel for her great-niece Eve Coulson, and was shocked to find the four-letter word repeated "several times" when she pre-read the book. "Since the book launched in March this year we have sold over 28,000 copies and this is the first complaint we have had," said a spokeswoman for Asda. She added that the chain would stock the new version of the book as soon as it became available.